The Texans made 10 roster moves today, including placing offensive lineman David Quessenberry on the reserve/non-football injury list. The Texans have to make four more moves to reduce their roster to the required 75 by Tuesday at 3 p.m. The Texans waived receiver Joe Adams, receiver Alec Lemon, guard Sam Longo, running back William Powell, nose tackle David Hunter, nose tackle Austin Brown, cornerback Junior Mertile, outside linebacker Terrance Lloyd and outside linebacker Lawrence Sidbury. The roster must be reduced to 53 next week. Because the Texans finished with an NFL-worst 2-14 record last season, they get the first claim on every player placed on waivers. 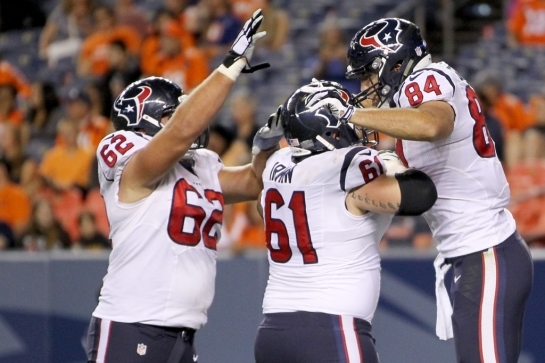 Texans tight end Ryan Griffin (84) celebrates with linemen Matt Paradis (61) and Alex Kupper (62) after scoring on a 31-yard touchdown pass with :59 left to play.